Subaru Impreza Wins 2012 JNCAP "Five Star Award"
Tokyo, November 28, 2012 - Fuji Heavy Industries Ltd. (FHI), the manufacturer of Subaru automobiles, today announced that the Subaru Impreza G4 (4-door Sedan) / Sport (5-door) series won the top rank "Five Star Award" for earning the maximum five star overall rating in the 2012 Japan New Car Assessment Program (JNCAP) crash safety evaluation tests conducted by the Ministry of Land, Infrastructure, Transport and Tourism (MLIT) and the National Agency for Automotive Safety and Victim's Aid (NASVA). 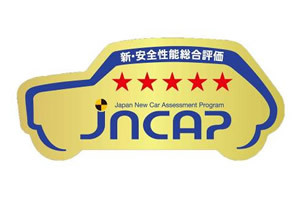 The JNCAP accolades for Subaru models include the 2007 JNCAP Grand Prix Award for the Impreza, the 2008 JNCAP Excellent Car Awards each given to the Forester and Exiga 7-seater and the 2009 JNCAP Grand Prix Award as well as 2011 Five Star Award for the Legacy, which demonstrates Subaru's continuous commitment to safety. Through its brand statement "Confidence in Motion", FHI is committed to offering its customers Subaru's distinctive "Enjoyment and Peace of Mind" driving experience. Subaru will continue to enhance its active, passive and pre-crash safety technologies under the Subaru "All-Around Safety" principle as the foundation of enjoyable, heartsease driving for drivers and passengers.